We work hard and play hard at work. We also eat well, with which I have a love/hate relationship. Someone on my team is an amazing chef and she keeps us well fed. A few weeks ago, a colleague brought in a plate of what I thought were chocolate chip cookies. Until I had my first bite. They brought me back to my childhood. My mom used to make congo squares. Basically they were chocolate cookie bars, dense and sweet. I loved them. I no longer have her recipe, and have tried to recreate her recipe many times. I came back a few times that day for more and more. Last night we made them so Chris could partake. Yum. Preheat oven to 350 degrees. In a mixing bowl, mix butter and sugars. Mix in egg and vanilla. Mix in flour, baking soda, and salt. Stir in chips. 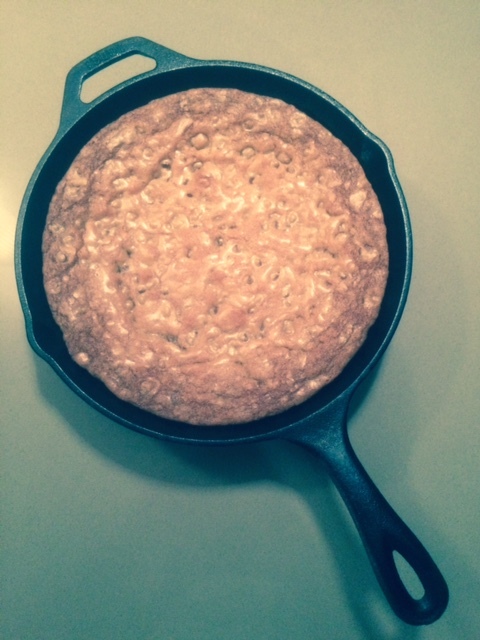 Transfer to a 10-inch cast-iron skillet; smooth top. Bake until cookie is golden brown and just set in the center, about 20 minutes. Let cool about 10 minutes. Note: Back in January I posted a recipe for a local restaurant’s version — Ned Ludd’s Chocolate Chip Cookie recipe. This Marta Stewart adaptation is so much better.